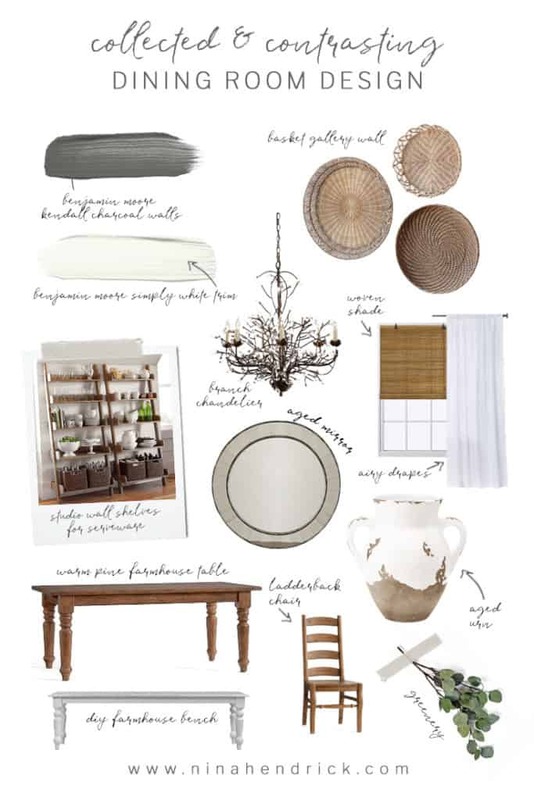 See the inspiration behind a Collected and Contrasting Dining Room Design. This room features a bold wall color, antique finishes, and a ton of texture. When we first made over our dining room back in 2016, I was still in the process of finding my style and we were on a pretty tight budget for the project. While there was a lot that I love about the final result, there were some things that felt a little off. Don’t get me wrong, it was a lovely room, but it still felt like something was missing! 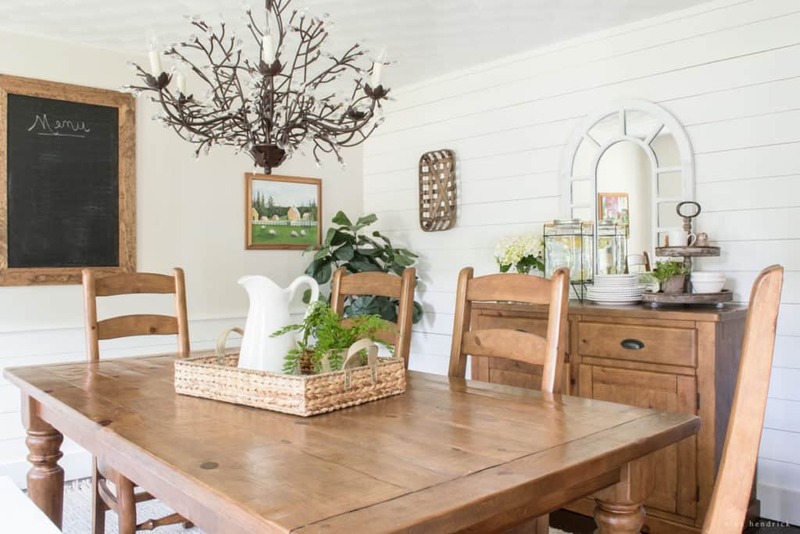 First off, we still weren’t ready to cover over the textured ceiling when we completed the original Planked Dining Room Makeover. It may seem like a small thing, but I feel pretty strongly that getting rid of the texture makes a HUGE difference. It not only absorbs a lot of light but also catches dust and dirt. I’m very happy to report that it’s since been covered over with smooth plaster and painted Benjamin Moore Simply White, which has made a noticable impact on the lighting of the room! When we completed the original makeover I wanted a paint color for the top of the three walls that was as close to white as possible. 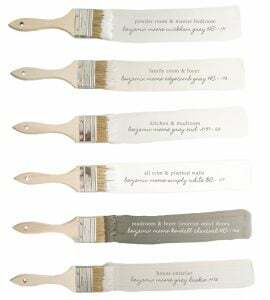 I chose Benjamin Moore Edgecomb Gray lightened by 50%. In this east-facing first story room, it always read a bit more yellow than I had hoped. As a result, I’ve been feeling for a while like I was ready for a change. With the newfound light bouncing off of the smooth ceiling (and necessity of painting the room anyway due to the new plaster), I decided it may be a good room for a contrasting paint color. 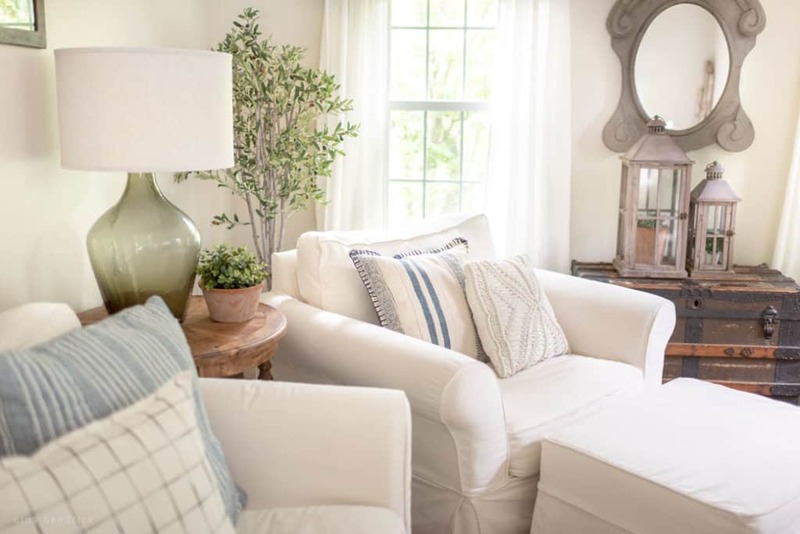 It felt like a more calculated risk to go dark with the paint color in this room because of the Benjamin Moore Simply White planked wall treatment. I knew I wanted the wall treatment to remain white because it’s a classic New England feature in our home. We visited a beautiful hotel in Bar Harbor this past summer that had white planked walls with contrasting Navy paint at the top. It’s hard to say that was my inspiration since I was already leaning this way, but it definitely validated the idea. I briefly considered also going with navy for the top of our walls, but instead ended up with Benjamin Moore’s Kendall Charcoal. 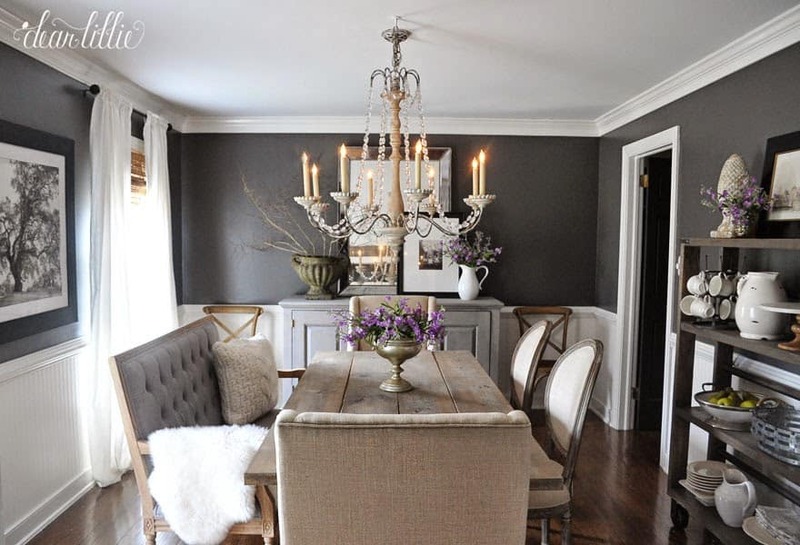 The photo above is the same color in a dining room, designed by the talented Jen of Dear Lillie. This color is already part of our Color Story, it’s the color I’ve painted the inside of the exterior doors, so it was a good fit. It’s a much bolder color than I would normally choose, but it feels more reflective of my evolving style. I’m happy with it! We are keeping our same furniture set that we purchased 10 years ago when we got married. Our farmhouse style table is the Pottery Barn Sumner Table in the (no longer available) Antique Pine finish. Here’s a source for a table wth a similar stain color. Our chairs are still available in the Natural Pine finish here. The farmhouse style bench was a DIY, you can get the tutorial here. Our buffet has sadly been discontinued, but this one has a similar stain color. Though not necessarily furniture, we are also keeping our woodsy Camilla Chandelier. I still love it! We didn’t get rid of anything big, however, we did add on to the collection with two of the Studio Wall Shelves shown above. The stain color is slightly different than our other furniture, but it ties in perfectly with our new wall decor, so it all worked out. 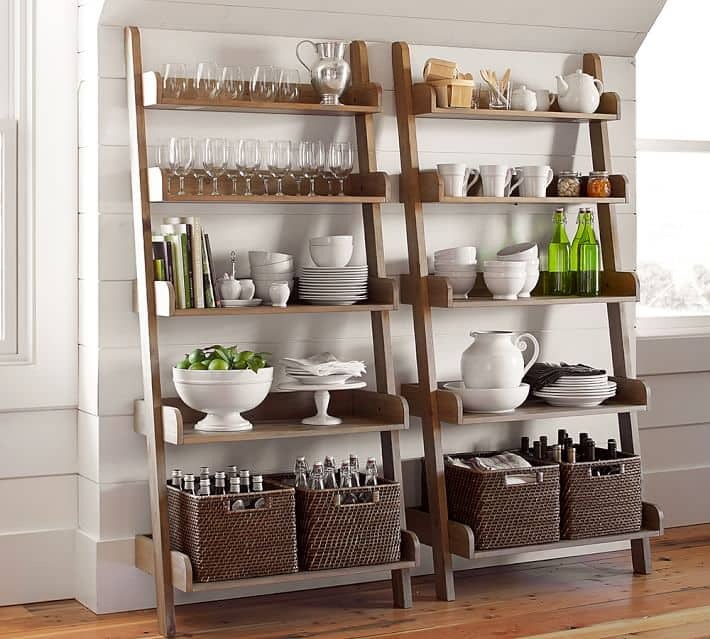 It holds my large collection of serveware easily and helps it function as decor. I loved my Grandfather’s oil paintings in the original makeover. Several will be going back into the room. One thing I didn’t love was the chalkboard. It seemed like a fun touch at the time, a place to write out holiday menus and even some chalk art. What it actually turned out to be was a lot of unnecessary pressure. Every season I felt like I had to come up with something for the chalkboard. Not fun at all! 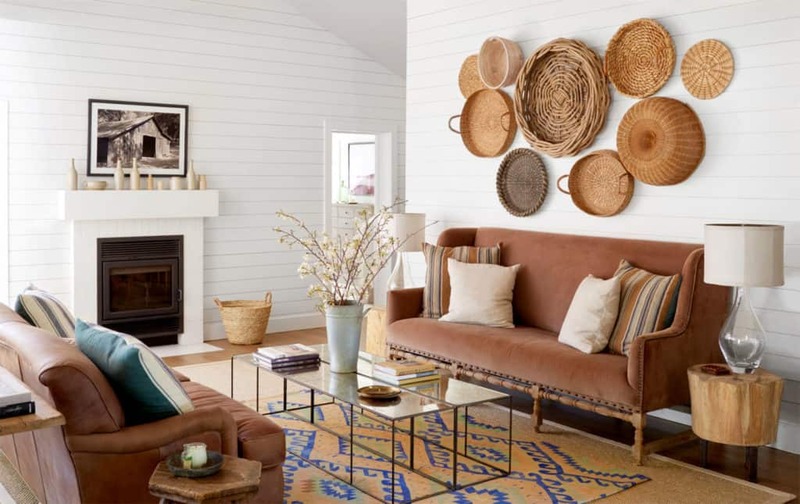 I felt inspired by this basket wall from this photoshoot styled by Heather Bullard. There were already baskets from the original makeover, and I added on to my collection with these oversized round baskets. I’ll probably continue to add to the collection over time! I put the baskets up on the wall where the chalkboard was previously. It feels like a much better solution. The white mirror that was here before is one of my favorites, but I felt like it was getting lost on the white wall. 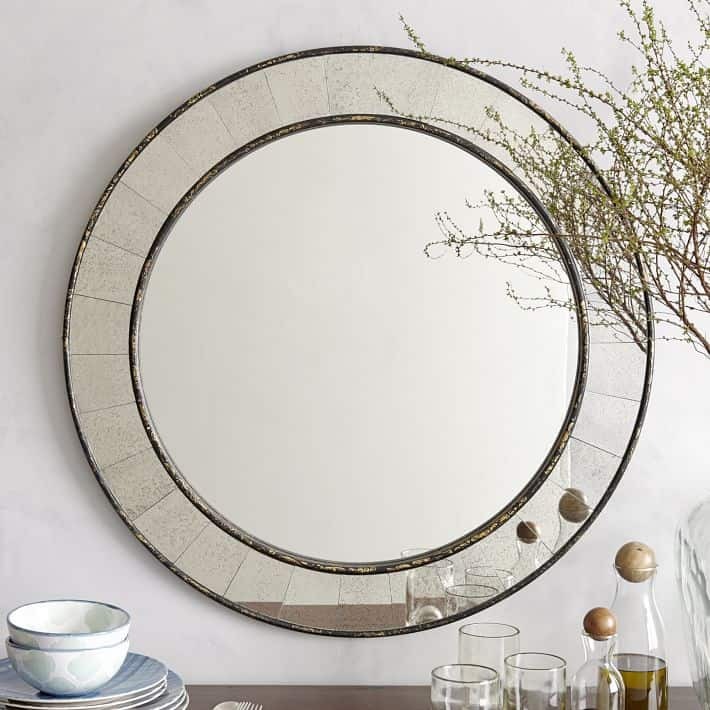 This handcrafted antique tiled wall mirror from West Elm again feels a bit different from my usual choice, but that’s what I love about it! The patina is really beautiful and it’s an interesting touch above the buffet. Overall, this room felt like an evolution of my style, which was fun and exciting after so many years of feeling stagnant in my design choices. That will be my guiding light moving forward. I hope that this may have inspired you to take some chances in your own dining room design. I’m excited to host many family dinners in this room! I LOVE Kendall Charcoal! My son recently built a house, and I did all the interior painting. Together, we chose that color for his master bedroom, with white ceiling and trim, and medium toned rustic wood flooring. It looks SO classy, and he loves it! That sounds so nice, Polly! It’s a great color.